Learning about research can be a daunting task. This best-selling core text book offers a comprehensive introduction to important research concepts, processes and issues. The author guides readers who are new to research but also introduces new debates and perspectives to those with some experience wanting to develop their skills further. This popular book equips students with the information and skills they need to read, comprehend and critique research. 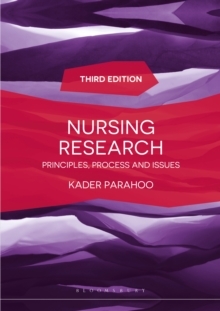 Whether an undergraduate taking an introductory research module, a postgraduate nursing student embarking on a project, or an experienced practitioner wanting to sharpen your skills, Parahoo's accessible writing style will ensure readers are able to utilise research throughout their study and in everyday practice. Pages: 440 pages, 15 Illustrations, black and white; 440 p. 15 illus.